In some cases, a customer may want to put a certain amount of money down, but is not able to pay all of that money up front. For any type of sale, the pick up note is a deferred down payment. You can enter an amount that the customer promises to pay by a certain date, or in a series of payments. This amount is NOT charged interest. A pick up note can be set up when you enter a sale (by clicking on Enter Sales). There is a space directly below the cash down payment field, and it is labeled Pick Up Note. Enter the total amount of the pick up note, and after entering the amount, a window will pop up. This window will show the total amount, and then will ask you to enter a number of payments. The payment amount will be computed automatically based on the total and the number of payments. If the pick up is going to be paid in more than one payment, you need to select weekly, bi-weekly, semi-monthly, or monthly. You also need to enter the first payment date, which will automatically default depending on which option you picked for the payment schedule, but can be manually changed to be whatever date you want. When you have completed all of this, click on OK. If this is a buy here pay here or outside financing sale, the first regular payment due date will default to occur After all the pick up note payments have been completed. If you wish the regular payments to begin before the pick up note payments have been completed, you can manually change the first payment date in the middle column of the Sales Processing Pricing screen. If this is a cash sale, the cash down payment plus the pick up note MUST equal the total cash price. By default, the cash down payment will equal the total cash price. If you wish to enter a pick up note, enter that first and then the cash down payment will be adjusted to equal the remaining balance. If the pick up note plus the cash down payment does NOT equal the total cash price, the only option you have is to adjust one or the other, or adjust the selling price of the vehicle. If the customer is only willing to put $3000 down and $1000 as a pick up note, but the total cash price is $4500, click on the Adjust Pricing button on the right side of the screen, and set the total cash price to be your desired amount (in this case, it would be $4000). Enter a pick up note payment as you would any other payment. For help entering payments, go to Entering Payments & Other Transactions. 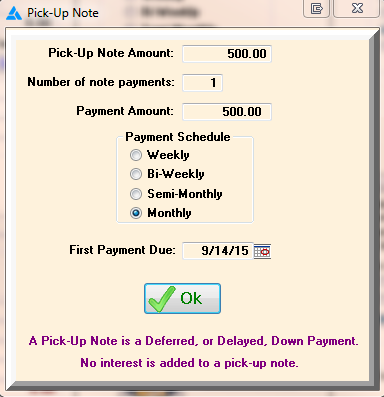 If the pick up note payments are due and paid before the regular payments, then as pick up note payments are entered they will be applied by default to the "Apply To" box in the bottom right of the payments screen, you can manually enter whether you want the payment to apply to the contract (or principal) balance or the pick up balance. You can also use the pick up note if you will be receiving cash down from the customer, and the rest in a check from a lien holder. If you are just receiving a single check and don't want to deal with hassle of a payments schedule, APR, etc., you can simply set it as a cash sale. Enter the amount the customer is putting down as the cash down payment. Enter the amount of the check you expect to receive from the lien holder as the pick up amount, and enter the number of payments as "1". For the first payment date, select a date you expect to receive the check by. You will still have to enter the lien holder information on the lien holder tab. When you receive the check, enter the payment as you normally would, and the program will ask you if this is the last payment you are expecting from the lien holder. You will click "Yes".